The urban civilization of the Newars of the Kathmandu Valley provides a paradigm for the study of caste and Hindu kingship. In this book, six anthropologists, in a genuinely collaborative international endeavour, pool their knowledge of the three ancient Newar cities of Kathmandu, Lalitpur, and Bhaktapur, and settlements nearby. The social institutions of all the main case groups - priests, patrons, artisans, farmers, and low castes - are given extended consideration, and the study is framed by a historical introduction and a comparative conclusion. In addition, it is well illustrated with fascinating black and white photos which have been specially taken to illustrate aspects of the society under study. The result is the most complete description and analysis yet of a regional caste system. Located within wider theoretical debates surrounding the nature of caste, the book should appeal not only to students of Hinduism and South Asia, but to all anthropologists and comparative sociologists interested in the interrelations of politics, ritual, kinship, economy, and ideology in complex, pre-industrial societies. The urban civilization of the Newars of the Kathmandu Valley provides a paradigm for the study of caste and Hindu kingship. In this innovative study six anthropologists, in a genuinely collaborative international endeavour, pool their knowledge of the three ancient royal cities of Kathmandu, Lalitpur, and Bhaktapur, and the nearby settlements which once formed part of their respective kingdoms. 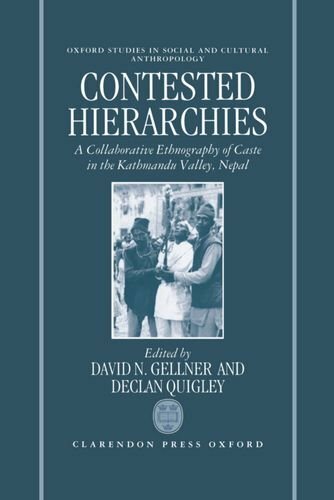 Contested Hierarchies opens with an introduction outlining the historical background and contemporary context of Newar society. In the central chapters of the book the social institutions of all the main caste groups - Hindu and Buddhist priests, patrons, artisans, farmers, and low castes - are given extended consideration. A comparative conclusion, which locates controversies about the Newars within wider theoretical debates over the nature of caste, demonstrates how the fundamental principles underlying all caste systems are particularly clearly exemplified by the Newar case.